What’s Your Deal, Monica Demarco & Christina Cavaleri? Many people in Albuquerque know Monica Demarco as a musician and composer, but in recent months she is becoming known for a different type of performance: aerial dance. She and another aerialist, Christina Cavaleri, will be presenting an aerialist performance at our ReLaunch party and we couldn’t be more excited to see their gravity-defying act! 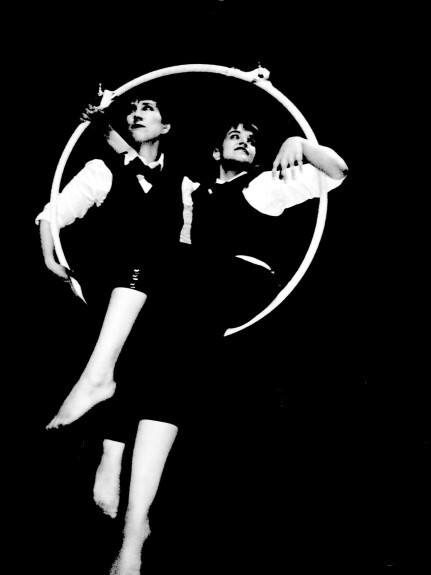 We will be performing as a doubles duo on one hoop (lyra) with themes that are in line with what Pyragraph is all about: the business of being creative women! Not to mention that it will also be a funky booty shaking good time. Christina is a lawyer who has been performing with AirDance NM for about two years. She has studied the art extensively and is an instructor. Monica is a piano teacher/composer who got her start trading composition for aerial training with AirDance NM and has been studying the art and performing in it for a year. Well aerial is a funny beast. It’s a good show when you don’t fall off (just kidding; we rehearse really hard and nothing like that has ever happened). We do get crazy burns and bruises during rehearsal that are hard to explain later. So far all of our shows have been pretty bangin’. Our piece is a Janelle Monáe tribute that highlights her ideas about the working class and gender. Check the song out here! Don’t give up on your ideas. There is always that point where it seems impossible and like the whole thing will be a huge disaster, even on a professional level. If we only put out art that we thought was going to be perfect, we wouldn’t put anything out at all. Push past the self doubt and get yourself out there!